Cedric Parker Gets a Permanent, 1933. Angus McVicar, George Stein and other Photo Copy Service photographers captured the soul of Madison with their cameras from the 1920s through the 1960s. These galleries showcase over 2,000 images from the Photo Copy Service available online. 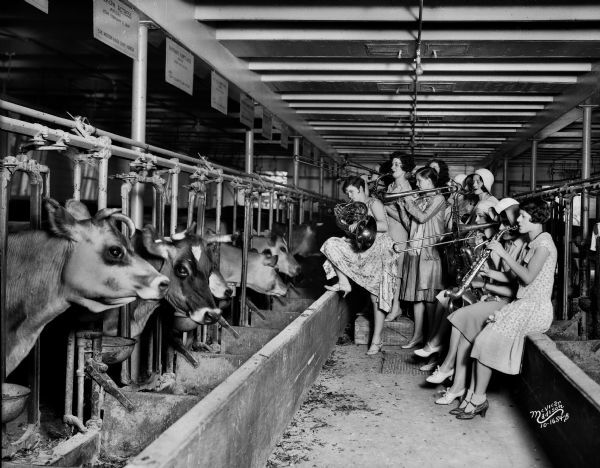 Female Band Serenading Cows, 1930. The Photo Copy Service collection consists primarily of Madison photographs taken by two commercial photographers, Angus McVicar (1903-1964) and George Stein (1913-2004). The subjects covered in the collection are varied due to the range of clients they served, including newspapers, small businesses, insurance companies, auto dealerships, sororities and fraternities, and private individuals. Because Photo Copy Service was located in Madison, Wisconsin, the images tend to concentrate on the downtown area, but they also include many views of the University of Wisconsin campus and activities, street scenes; the built environment; civic, educational, governmental and fraternal organizations; businesses and store fronts; and window and merchandise displays. As the primary photographer for Photo Copy Service, Angus McVicar developed commercial photographs to satisfy his customers' needs. However, the images have far broader appeal that transcends the purpose for which they were originally created. McVicar primarily photographed the exteriors of businesses, usually for advertising purposes; but he also included interiors and people engaged in their daily work. While at the Capital Times newspaper, he broadened the scope of his subjects to include celebrities, car accidents, fires, and other newsworthy events. 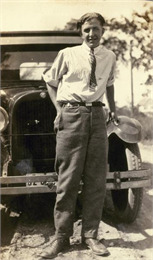 Angus Boyd McVicar was born June 17, 1903, in Sheboygan Falls, Wisconsin. In 1917 he moved to Madison with his parents, Dea and Anna. He attended Carroll College in Waukesha for two years, then returned to Madison in 1925 to marry his childhood sweetheart, Genevieve Milward. The following year, at the age of 23, he started the McVicar Photo Service in the basement of the family's floral shop at 723 University Avenue. 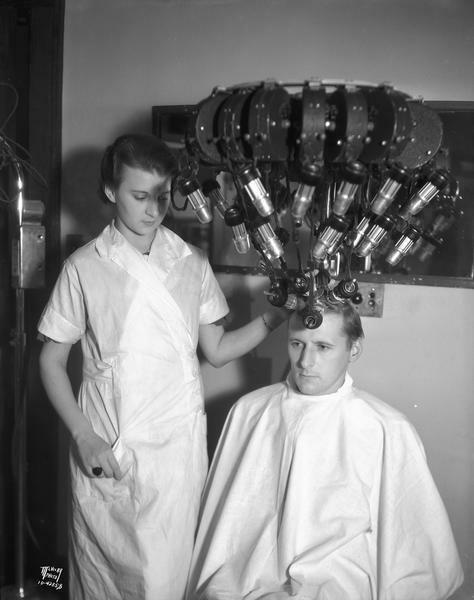 Incidentally, he was the first photographer in Madison to use a flash for supplemental lighting. In 1942, McVicar sold his photography business to George Stein, who had worked for McVicar since he was a teenager. Stein renamed the business Photo Copy Service. McVicar then concentrated on running his family's more lucrative floral business. During World War II McVicar was a volunteer Civilian Defense plane spotter. After the war, the floral industry was so competitive that he closed the University Floral Shop and went back into photography. He worked for Stein's Photo Copy Service until 1958 and for the University of Wisconsin from 1957 to 1964. McVicar's hobby was photographing flowers, and he was a member of several nature conservation organizations, as well as a long-time Mason. He died May 9, 1964, in Madison. Both he and his wife are buried in Forest Hill Cemetery. Stein moved the Photo Copy Service business to his home in Verona in 1963, when his West Mifflin Street building was bought by the city of Madison. He continued to take photographs into the 1980s. Until the 1950s, when the transition was made to 4x5-inch format, all of the Photo Copy Service imageswere made using an 8x10 camera. 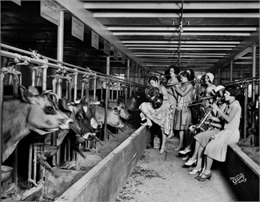 The resulting large format negatives provide exceptional detail and tone to the subjects McVicar and Stein chose to photograph. In 1999, Historic Madison, Inc. purchased the Photo Copy Service collection from a private collector, then donated it to the Wisconsin Historical Society. Of the approximately 10,000 images in the collection - both negatives and prints - about 2,000 are available online. The entire collection may be accessed in the Archives Research Room.